Offering you a complete choice of products which include prism set, point load index tester hand operated, auto optical engineers level, engineers dumpy level, vernier transit theodolite and dumpy level. With our rich industry experience in the respective domain, we offer our clients reliable Prism Set . These are manufactured in strict compliance with the international quality standards. Our Prisms are available in a large variety and in different specifications. We are manufacturer,supplier and exporter of point load index tester:Used for testing rock, aggregate and core samples as well as out crop specimen in their original shape. Very useful for rock classification. This is a portable instrument and is useful in the field also. Uniaxial compressive strength for rock specimen can also be predicted approximately. The instrument comprises of :- A three pillar type load frame on the base of which at the centre is fixed a 10 Tonne capacity hydraulic jack with a conical platen at the top of jack. The other conical platen is fixed to the top plate of the frame at its centre. A distance between two conical platen is fixed to the top plate of the frame at its centre. The distance between two conical platens is adjustable by vertical movement of the upper plate of the load frame. Loading jack wih integral hand operated pump and a pressure gauge 0-2500 kg x 25 kg.Optional : Pressure gauge 0 - 10000 kg x 50 kg. We offer Engineers Dupy Level having 'U' bubble arrangement. There various properties of these levels. 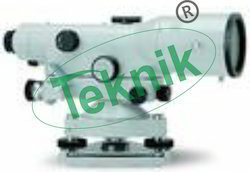 Matching with the needs of the clients, we provide Vernier Transit Theodolite. The Vernier Transit Theodolite is manufactured using technologically advanced machinery and is known for its accuracy. Promising excellent performance and long functional life, our Vernier Transit Theodolite is high on demand in the market. With their reliable performance, our Vernier Transit Theodolite is totally worth its value. Quick setting dumpy level with erect image, 20x magnification, in plastic carrying case. Length case. Length 225mm/175mm. Complete with wooden or aluminium folding tripod. Axis made up of aluminium & brass. With telescope 228mm/9” long , Internal focussing, Quick Setting type, Coated optics, ERECT - IMAGE, Very Precise. The horizontal brass circle graduated to read 6 minutes with vernier having provision to preset zero quickly for any desired horizontal direction, All moveable parts including axis set and foot screws are made of gunmetal and brass. packed in Fibre box with Special Powder coated Aluminum telescopic stand in canvas case. 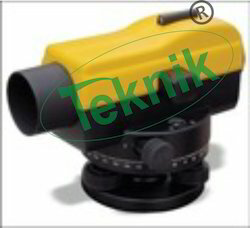 We are offering a wide range of Electronic Total Station. Fully transitting, coaxial sighting and distancemeasuring optics. Data Storage approx. 10 W points. With the support of our adroit professionals, we provide our clients a high quality Automatic Levels that is better than any other automatic level available in the markets. This product is designed employing quality-proven material and high-end technology following the current market standards. Our offered product is checked on numerous parameters before supplying in the market. Customers can avail the offered product from us in various specifications as per their requirements. 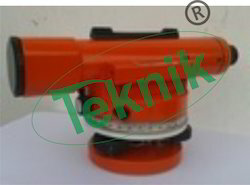 a) Manufactured meticulously using International Standard.b) Tightly sealed construction for use in any weather.c) Fast accurate two-speed focusing.d) Friction-braked rotation and endless horizontal drive.e) Optical sight for quick pointing.f) Metal circular bubble.g) Fit all tripod with G5/8" or M16 screw.h) Optional accessories: Metal or wooden tripod, metal or wooden staff range pole, measuring rope, plumb etc. including Toolkit, Operation Manual, Carrying Case, Plumbob. This cost-effective Electronic Digital Theodolite provides excellent performance, reliable quality and practical operation for any construction application. 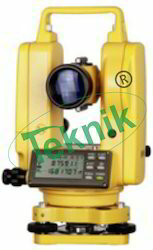 The body style is similar to a Topcon Digital Theodolite and is combined with easy to use operation. The smart appearance and reasonable structure is as attractive as its price. Our clients can avail from us precision engineered Aluminium Levelling Staves. Our Aluminium Levelling Staves are made out of high quality Aluminum metal which ensures corrosion resistance. The Aluminium Levelling Staves that we offer provide exact readings as we make them as per the international quality norms. These Aluminium Levelling Staves are offered at competitive prices. A. Leveling staves all aluminum body superior quality size 4 meter in 3 folds B. Leveling staves all aluminum body superior quality size 5 meter in 3 folds C. Leveling staves all aluminum body superior quality size 6 meter in 3 folds D. Leveling staves japanese type 4 meter 4 fold deluxe type. E. Leveling staves japanese type 5 meter 5 fold deluxe type. F. Leveling staves japanese type 6 meter 5 fold deluxe type. 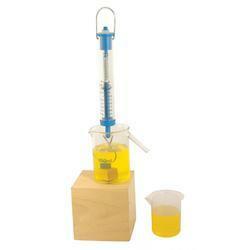 Archimedes Principle Kit Our products are for use in a Laboratory or educational setting only. A complete self contained kit for exploring the concepts related to buoyancy and Archimedes' principal, both qualitatively and quantitatively.Comprises a regular shaped metallic solid (whose volume can be computed from its external dimensions). Irregular shaped solid beaker to collect displacement liquid.Newton meter and displacement vessel. 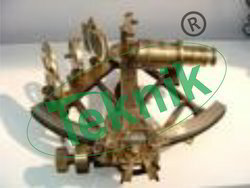 Our organization has pioneered the manufacturing of Nautical Sextant which is available in 17 designs. It can be availed in a standard size of 8 inch, and can also be manufactured as per client requirements. 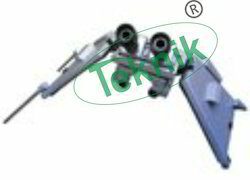 The sextant has been designed to facilitate easy mechanism and movement, so that it can be handled smoothly. 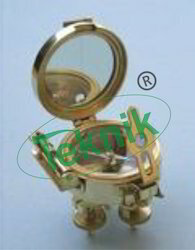 We ensure that we use superior quality of brass and provide the sextant with an antique brass finish. 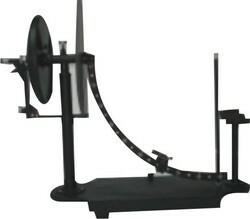 The Nautical Sextant can be customized to meet the requirements of the clients. We are offering a wide range of Survey Compass. Compass survey is a method of surveying by taking bearings and linear distances to produce plan. Bearing is measured using prismatic compass, while the linear distance is measured using measuring tape. Bearing in compass surveying means angle is made by chain line or survey line by referring it to magnetic meridian or magnetic north. We are an incomparable name in offering a superior quality Telescopic Alidade. 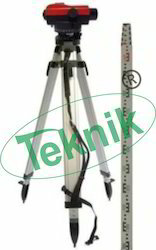 The offered telescopic alidade is suitable to use for the purpose of measuring height and distances with the help of angular slanting. 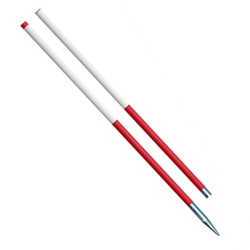 We offer this telescopic alidade on number of specifications as per the variegated needs of customers. Our offered telescopic alidade is packed with quality material to enhance its life. Telescopic Alidade with more accuracy at a very competitive price. Size 178mm /7” Internal focussing, anti reflection coated optics with tilting arrangement and Fitted with revolving horizontal circle graduated to read 6 minutes with vernier and a provision to preset zero degree quickly. 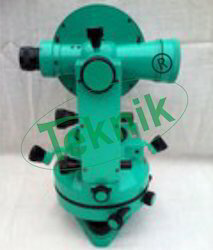 The tilting drum is graduated to read 1:5000 is incorporated for fine adjustment and accuracy. Supplied with accessories and adjusting tools Packed in PVC Plastic box with Aluminium telescopic stand in carrying canvas cover. We offer a wide range of very high quality Plane Table Accessories that are suitable for maps preparation and recording topography in various engineering surveys. This outfit consists of a plane table board with a fitted tripod. These products undergo various quality tests at each level of its production to ensure superior quality and flawless performances. These products are basically used in the construction industry for the purpose for surveying the land for commercial use. These products are available at very affordable market price. These products are manufactured using latest technology machinery and skillful group of employees to ensure superior quality. Opital Plummet with 90" main bubble (MS-35). For Accepting any holder with target plate. 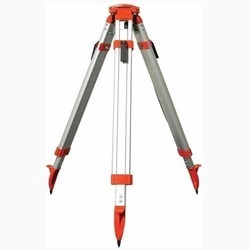 The Hand Level is a small, economical level for use with preliminary surveys to determine traveller way or cable way steel work elevations and other feasibility type site reconnaissance work. The Abney Level is very similar to a clinometer in that it is used to measure the value of a slope by means of arc measure and grade percentage. The drive is by means of a rack and pinion manually through a gearing arrangement. The gear box and pinion are fixed on two handles, sprockets and chain arrangement. The movement of the rack is guided by a bracket ( attached to the rack) and two pillars. The penetration resistance i.e. the pressure is indicated on hydraulic gauges through a hydraulic measuring head. 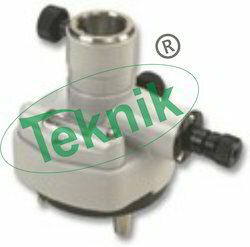 Two pressure gauges of 15cm dia dial and 2 capacities 0-160kg/cm are provided. An automatic cut-off valve, to protect the low capacity gauge from being overloaded is provided. The 2 valve can be adjusted and locked at desirable values between 20 to 60cm . A provision is made to anchor the unit to the ground (with the help of four anchors supplied with the unit) and there is a provision for lateral 2 movement of the unit so that subsequent tests could be performed without shifting the entire anchorage. A 10cm penetration cone with friction jacket is provided along with fifteen mantle tubes (non-uniform having an effective length of 1 m each with sounding rods for finding out the cone (point) resistance or jacket friction. A chain is a unit of length. Measuring Chain consisting of a fixed number of straight links of galvanized mild steel wire 4mm in diameter. The end of each link are bent into a loop and connected together by means of three circular shape rings. The joints of the rings made be open or welded preferably welded. 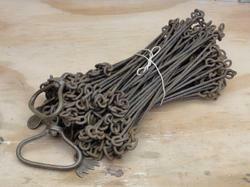 The ends of the chain are provided with brass handles. The handle is linked with a swivel joint to the chain. The length of each linked is 200 mm. each meter is provided with circular brass ring & each five meter length is provided wit brass talltes ofrequisite shapes each chain should be provided with 10 nosof M.S.Arrows of 4 mm diameter bar and 40 cm. We are offering a wide range of Rapid Moisture Meter. For quick determination of moisture content of materials in powder form viz. Soil, sand, coal, pottery slip, cement etc. Calcium carbide when comes in contact with moisture acetylene gas in generate. This principle is used in rapid moisture meter. 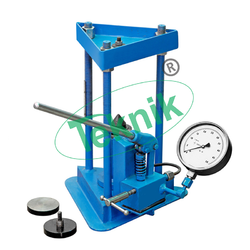 A weighted quantity of sample is mixed with fixed quantity of calcium carbide reagent and the whole mixture is thoroughly shaken in a vessel to which a pressure gauge is fixed. 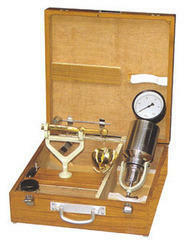 The acetylene gas produced developes pressure and pressure gauge is calibrated to read percentage moisture. The instrument indicates moisture on wet/weight basis easily convertible to dry weight basis. We are engaged in offering a wide range of Ranging Rods which finds their wide application in measuring various directions. These Ranging Rods offered by us are fitted with straight chains which help in pointing the directions. We are extensively acclaimed for our products high durability and optimum performance. These products offered by us are made in accordance to various international standards to offer optimum performance. 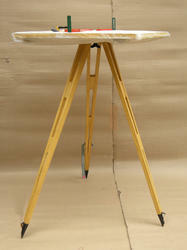 We have with us Tripods Stands that are available in several sizes, shapes and designs at market leading prices. 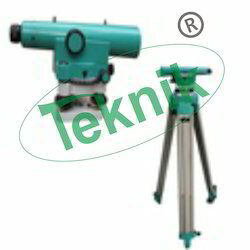 Our tripods are procured from the trustworthy vendors of the market and are widely used for diverse applications. Moreover, all our products are thoroughly checked and tested by expert quality controllers to ensure flawlessness. Made of Aluminium body Telescopic in 3 PCS, 4 meter in length packed in canvas cover, graduated in meters, dm, cm and mm with white background and black strips. 5mm thick with suitable locking arrangement. 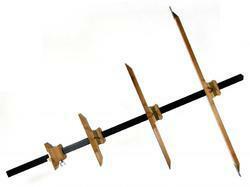 ii) Made of Aluminium body / Metalic Body folding in 2 PCS, 4 meter in length graduated in meters, dm, cm and mm. With white background and black strips. 5mm thick with suitable folding & locking arrangement. The cross-staff consists of a long staff with a perpendicular vane which slides to and fro upon it. We mark the staffs with graduated measurements – which are precise. The angles can be then measured by holding it so that the ends of the vane are in level with the points that need to be measured. It is widely used to measure the altitude of the sun, and also different latitudes, aside from being used as a navigation instrument. We offer the cross staff at a competitive price and can modify it according to customer needs.our company shreeji instruments . Sapphire survey instruments offer a wide range of Plane Table sets in all quality as per requirements like regular in aluminum, full brass, brass q mark & brass isi with wooden regular, wooden teak & aluminum stand. which are suitable for maps preparation and recording topography in various engineering surveys. This outfit consists of a plane table board with a fitted tripod. These outfits can work complete with standard accessories namely trough compass, telescopic alidade, spirit level, canvas cover, plumbing fork etc. Looking for Surveying Instruments ?